This article is about the Beach Boys song. For other uses, see God Only Knows (disambiguation). "God Only Knows" is a song written by Brian Wilson and Tony Asher for American rock band the Beach Boys, released in May 1966 as the eighth track on the group's album Pet Sounds. Two months later, it was released as the B-side of "Wouldn't It Be Nice" in the United States. In other countries, "God Only Knows" was the single's A-side, peaking at number 2 on the UK Singles Chart. The song names God in its title and lyrics, which was unusual for a pop single at the time. The sentiments expressed in the lyrics were not specific to any God, and could be addressed to any higher force, being a song about moving forward after loss. Wilson said that his and Asher's intention was to create the feeling of "being blind but in being blind, you can see more". Sung by Brian’s younger brother Carl Wilson, the Beach Boys' recording was produced and arranged by Brian using an unorthodox selection of instruments, including French horn, accordions, sleigh bell, harpsichord, and a quartet of violas and cellos heard throughout the piece in counterpoint. Its complex musical structure has been cited for its disuse of authentic cadences and a definite key signature. The perpetual rounds in its coda was also unusual for popular music of the era. 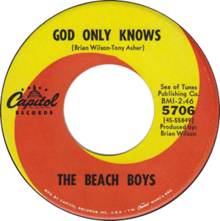 "God Only Knows" was voted 25th in Rolling Stone magazine's 500 Greatest Songs of All Time, and was ranked by Pitchfork Media as the greatest song of the 1960s. The Rock and Roll Hall of Fame includes it as one of "500 Songs That Shaped Rock and Roll". Genres attributed to "God Only Knows" include baroque rock, baroque pop, art pop, psychedelic rock, avant-pop, and experimental pop. Brian Wilson has said that he wrote the song as an attempt to match the standard of the Beatles' Rubber Soul album, which was released in December 1965. In his recollection, he was under the influence of marijuana and was "so blown away" with the album that he sat at his piano and began writing the song. It's really very like the way classical music works, like a classical opera, say Lakmé by Delibes (the music that British Airways has appropriated). The melody rises and falls while the echo of that melody, sung by another voice, intertwines with it. Then it goes back to the verse, with its own melody, which is a variation on the chorus melody. As that is sung, the background voices provide an abstract, disconnected harmony. All the time, upfront, is the poetic heart of the lyric. The key gravitates between A major and E major, while the bass-line was written in a different key from the rest of the song. The music theorist Daniel Harrison compared the song to an earlier Brian Wilson composition, "California Girls", as it both avoids a root-position tonic and suppresses a cadential drive. It also contains a step-wise descending bass-line like Wilson's other compositions on the Pet Sounds album. Dominic King believed the barbershop flat seventh saved the song from "excessive sentimentality". After its instrumental linking passage, the key ascends to its fourth interval. According to author Jim Fusilli: "Brian came pretty close to writing himself into a dead end. There's really nowhere to go coming out of the bridge, which modulates to G major from D major but ends with a D major–A major–B minor pattern. Thus, when the song returns to D Major, it must do so from B minor, which is kind of a static change, particularly when the next chord is a B minor with only a slight variation in the bass." Along with the 8+4 measure verse/chorus scheme, Downes called the idea of a "bridge section in a related key" standard for rock/pop music, but adds: "What is different here, however, is how the move to the subdominant in the bridge conditions the tonal behavior of the entire song, which, though nominally in E Major, is characterized throughout by a tension between it and A major." The "choral fantasy" during this key change eventually concludes that "a clear sense has eluded us for the entire experience–that in fact, the idea of 'key' has itself been challenged and subverted", in Lambert's opinion. The song closes with perpetual rounds, a centuries-old technique that was not normally heard in pop music of its time. According to Wilson: "I liked all those old songs that used rounds, like 'Row, Row, Row Your Boat' and 'Frère Jacques'. I liked rounds because they made it seem like a song was something eternal." The song is told from the point of view of someone contemplating life without their lover, as Asher describes, "'I'll love you till the sun burns out, then I'm gone,' ergo 'I'm gonna love you forever.'" Wilson explained that "God Only Knows" was "a vision that Tony and I had. It's like being blind but in being blind, you can see more. You close your eyes; you're able to see a place or something that's happening." He initially hated the opening line of the song as "it was too negative." He eventually gave in after hearing the subsequent lyrics. In 1976, Brian said there was no one particular that the song was written for. This is the one [song] that I thought would be a hit record because it was so incredibly beautiful. I was concerned that maybe the lyrics weren't up to the same level as the music; how many love songs start off with the line, "I may not always love you"? I liked that twist, and fought to start the song that way. Working with Brian, I didn't have a whole lot of fighting to do, but I was certainly willing to fight to the end for that. ... "God Only Knows" is, to me, one of the great songs of our time. I mean the great songs. Not because I wrote the lyrics, but because it is an amazing piece of music that we were able to write a very compelling lyric to. It's the simplicity—the inference that "I am who I am because of you"—that makes it very personal and tender. The first time I heard it, Brian played it for me at the piano. And I went, "Oh my God, he's talking about God in a record." It was pretty daring to me. And it was another time I thought to myself, "Oh, boy, he's really taking a chance." I thought it was almost too religious. Too square. At that time. Yes, it was so great that he would say it and not be intimidated by what anybody else would think of the words or what he meant. Music journalist Jim DeRogatis states that, as was common in psychedelic rock, the spiritual invocations in "God Only Knows" express non-specific sentiments which could be addressed to any higher force, and that it is "less of a prayer than a sensitive meditation about moving forward in the face of loss". Brian described his bandmate and younger brother Carl Wilson as "the most truly religious person I know", and Carl was forthcoming about the group's spiritual beliefs stating: "We believe in God as a kind of universal consciousness. God is love. God is you. God is me. God is everything right here in this room. It's a spiritual concept which inspires a great deal of our music." Gil writes: "It’s a love song, yes, but again, echoing its classical forebears, there is something not quite secular about it. Yes, 'God Only Knows' is a common, casual phrase, but in this context it feels much more literal." The instrumental section of the song was recorded on March 10, 1966, at United Western Recorders, Hollywood, California, with the session engineered by Chuck Britz and produced by Brian Wilson. The instrumental part of the song took 20 takes to achieve what is the master take of the song. Present on the day of the instrumental recording was Carl on twelve-string guitar among other session musicians collectively known as The Wrecking Crew. A strip of masking tape was placed over the strings of a piano while the bottoms of two plastic orange juice bottles were used for percussion. According to Brian, many of the musicians who were present at the "God Only Knows" sessions claim that those sessions were some of "the most magical, beautiful musical experiences they've ever heard". [need quotation to verify] He added that there were 23 musicians present during the "God Only Knows" sessions, though only 16 are credited as being present on the actual take that was used for the final song. [need quotation to verify] At the time, 23 musicians was an astounding[according to whom?] number of musicians for a pop record. All the musicians played simultaneously, creating "a rich, heavenly blanket of music". A string section was overdubbed thereafter. "I was honored to be able to sing that one. It is so beautifully written, it sings itself. Brian said something like, 'Don't do anything with it. Just sing it real straight. No effort. Take in a breath. Let it go real easy.' I was really grateful to be the one to sing that song. I felt extremely lucky." Brian originally intended to sing lead vocal on "God Only Knows" but after the instrumental portions of the song had been recorded, Brian thought Carl could impart the message better than he could. Brian reflected in October 1966, "I gave the song to Carl because I was looking for a tenderness and a sweetness which I knew Carl had in himself as well as in his voice. He brought dignity to the song and the words, through him, became not a lyric, but words." At the time, it was rare for Carl to sing lead on a Beach Boys song. Bruce Johnston explains that "Brian really worked a lot on 'God Only Knows', and at one point, he had all the Beach Boys, Terry Melcher and two of the Rovell sisters [Brian's wife Marilyn and her sister Diane] on it. It just got so overloaded; it was nuts. So he was smart enough to peel it all back, and he held voices back to the bridge, me at the top end, Carl in the middle and Brian on the bottom. At that point, Brian's right move was to get subtler. He had a very tender track here. 'God Only Knows' is a very small masterpiece with a major heartbeat, and he was right to peel everybody back and wind up with the three parts. In fact, it's probably the only well-known Beach Boys track that has just three voices on it." The final vocal track was recorded between March and April 1966 at CBS Columbia Square, Hollywood, with the session engineered by Ralph Balantin and produced by Brian. The song features three voices on the track. Carl is featured on lead vocals, with Brian and Johnston backing him. Johnston explained that, "The really cute thing is that at the end of the session, Carl was really tired, and he went home. So Brian ... remember, this was 8-track, so, he now has these extra tracks at his disposal. But there were just the two of us. So in the fade, he's singing two of the three parts. He sang the top and the bottom part and I sang in the middle." Brian used the production technique of double-tracking Carl's voice, so that his voice is simultaneously singing the same part twice, to give the vocal a fuller and richer sound; Brian used this technique often during the recording of Pet Sounds. The song's sessions concluded on April 11. Per band archivist Craig Slowinski. The song first appeared on the Beach Boys' 1966 album Pet Sounds in monophonic sound format. Initially, Brian considered releasing it as a single under Carl Wilson's name, but the group were in demand for a new single. Because their impending "Good Vibrations" was not yet ready, "God Only Knows" was issued instead. On July 11, 1966, it was issued as the B-side of the American "Wouldn't It Be Nice" single. In other territories, the song was the A-side. The song only reached 39 on the Billboard Hot 100 chart in 1966. Treated as the A-side across Europe, it was a success, peaking at number 2 in the UK, and in national charts cited contemporarily by Billboard: 3 in Ireland, 4 in the Netherlands and Belgium, 6 in Norway, 22 in Germany; and 2 in Australia. In September, the song peaked at 6 in Canada and 24 in France. Domenic Priore reports that in some parts of the United States, "God Only Knows" was banned from radio for blasphemy. The song appears in several stages of the recording process on The Pet Sounds Sessions box set, including its original monophonic mix; the first ever original stereophonic mix of the song, which was mixed by Mark Linett; highlights from the tracking dates, which documents the progress of the recording of the instrumental track; the finished instrumental track; an a cappella mix of the song; an alternate version, with a saxophone solo; another alternate version with an a cappella tag; and a version with Brian singing lead vocals. Live recordings appear on three of the band's albums: Live In London (1970), Good Timin': Live at Knebworth England 1980 (2002), and Live – The 50th Anniversary Tour (2013). As solo artists, Brian released live versions of the song on Live at the Roxy Theatre (2000) and Pet Sounds Live (2002); Al Jardine released a live version on Live in Las Vegas (2001). The level of Wilson's studio artistry–he used session musicians, double-tracking, and other techniques–was astounding. "God Only Knows" literally remade the ideal of the popular love song (using, for example, harpsichord and French horn as melodic instruments in the song); it stands as one of the most complex—and beautiful—songs in the annals of American popular music. Author Barry Miles wrote that it was one track of Pet Sounds which proved that rock music was an art form. Sound engineer Eugene Gearty called "God Only Knows" a perfect example of "how much [Brian] modulated from key to key. He was far more complex than the Beatles and mostly like [Igor] Stravinsky in orchestral music where the key changes and key centers change four or five times within a pop tune, which is unheard of." Gill believes: "I can’t think of any other 'pop love song' that is pinioned between a febrile, almost desperate desire and fear and its opposite, a contented contemplation of a harmonious relationship." Mojo magazine ranked the song as the 13th greatest song of all time. In a poll on the MTV station, VH1, it placed at number 28 on the UK's Nation's Favourite Lyric. It was voted by listeners of BBC Radio 2 as one of the three songs that changes people's lives. In its list of the 100 best singles of the last 50 years, Popdose ranked "God Only Knows" at number 1, saying: "It is simply one of the most beautifully composed and arranged songs in the history of not just pop music, but Western music. To place 'God Only Knows' in its proper context is to compare it not just to 1966 Paul McCartney, but 1836 Frédéric Chopin." English broadcaster Dominic King deemed it the most "perfectly constructed song in pop history". Brian's mother, Audree Wilson, believes that "God Only Knows" was one of Brian's finest ever compositions, as she stated in an interview: "'God Only Knows' ... What can you say about it? I still think it's one of his greatest pieces." Entertainment Weekly ranked the song number one in its "Fifty Greatest Love Songs" list. McCartney has called it his favorite song of all time. In an interview with David Leaf in 1990 he stated, "I was asked recently to give my top 10 favorite songs for a Japanese radio station ... I didn't think long and hard on it but I popped that [God Only Knows] on the top of my list. It's very deep. Very emotional, always a bit of a choker for me, that one." Speaking again in 2007, McCartney said: "'God Only Knows' is one of the few songs that reduces me to tears every time I hear it. It's really just a love song, but it's brilliantly done. It shows the genius of Brian. I've actually performed it with him and I'm afraid to say that during the sound check I broke down. It was just too much to stand there singing this song that does my head in and to stand there singing it with Brian." Brian responded apprehensively to McCartney's admiration of the song in the 1970s: "Like, if 'God Only Knows' is the greatest song ever written, then I'll never write anything as good again! And if I never write anything as good, then I'm finished." The song inspired songwriter Margo Guryan to move into writing pop music. She said: "I thought it was just gorgeous. I bought the record and played it a million times, then sat down and wrote 'Think of Rain'. That's really how I started writing that way. I just decided it was better than what was happening in jazz." Bob Stanley of Saint Etienne wrote that "It's impossible to exaggerate how beautiful this song is. Everywhere, it takes risks." Bono said in October 2006 during Brian Wilson's induction into the UK Music Hall of Fame that "the string arrangement on 'God Only Knows' is fact and proof of angels". [need quotation to verify] Jimmy Webb, an American popular music composer, has also stated his love for the song, stating, "I love 'God Only Knows' and its bow to the baroque that goes all the way back to 1740 and Johann Sebastian Bach. It represents the whole tradition of liturgical music that I feel is a spiritual part of Brian's music. And Carl's singing is pretty much at its pinnacle—as good as it ever got." In a 2003 solo concert in Tel Aviv, Steven Wilson, frontman of Porcupine Tree, declared "God Only Knows" as his favorite song of all time. On the Insurgentes listening party that took place in Mexico City in 2009, Steven Wilson said it was a perfect song. Simon Neil of Scottish band Biffy Clyro has the lyrics "God only knows what I'd be without you" tattooed across his chest. 1989: The Wonder Years – used in the episode, "Heartbreak"
2016: The Goldbergs – used in the third episode of the fourth season, "George! George Glass!" 2017: The Leftovers – used in the seventh episode of the third season, "The Most Powerful Man in the World (and His Identical Twin Brother)"
2019: Grace and Frankie – used in the thirteenth episode of the fifth season, "The Alternative"
2013: BioShock Infinite – contains a turn-of-the-century barbershop quartet that sings the song while floating past the player on an airship. As the game is set in 1912, the song is used anachronistically, one of many time-bending experiences that characterize the game. A cover version of the song was simulcast across BBC television and radio channels on October 7, 2014, to launch BBC Music. It featured Brian Wilson himself and other major artists from different musical genres (creating a supergroup called the Impossible Orchestra). The music video, directed by François Rousselet, features the artists in lavish, fantastical computer generated settings. The track was released the following day as a charity single for Children in Need 2014. Wilson said: "All of the artists did such a beautiful job ... I can't thank them enough, I'm just honored that 'God Only Knows' was chosen. 'God Only Knows' is a very special song. An extremely spiritual song and one of the best I've ever written." Despite the musicians all performing free, the promotion has drawn some criticism in the press. Adam Sherwin wrote in The Independent: "With its message, that the BBC 'owns' the entire musical waterfront and licence-fee payers would do well to remember that, it is the kind of propaganda film an autocratic regime sensing that its legitimacy is crumbling might produce." Writing for The Guardian, Alex Petridis observed "There's clearly something a little self-aggrandising about the BBC getting a raft of stars to sing an unambiguous song of undying devotion apparently to the corporation itself. ... perhaps we should forgive them three minutes of self-congratulation, particularly when it’s raising money for charity." The Daily Telegraph, however, reported that the project cost less than the 1997 version of "Perfect Day" which drew much of the same criticism but went on to raise over £2 million for charity. Lauren Laverne, Gareth Malone, and Zane Lowe also appear in the video. ^ David Howard called it the first pop single to name "God" in its title. Steven Gaines, Keith Badman, and Tony Asher have said that nobody had named "God" in a pop song's title before. Despite this, Philip Lambert noted that doo-wop combo the Capris had issued a song in 1954 with the title "God Only Knows". ^ a b Leaf, David (1997). The Pet Sounds Sessions (CD Liner). The Beach Boys. Capitol Records. ^ a b "200 Greatest Songs of the 1960s". Pitchfork. Retrieved 2010-07-24. ^ a b c d e f g h i j k l m n o Dillon 2012, p. 117. ^ a b c d Downes 2014, p. 37. ^ Beckerman, Jim (March 21, 2015). "'Walk Away Renee' collaborator Michael Brown of Englewood Cliffs, dies at 65". The Record. ^ Jones 1995, p. 214. ^ Valentish, Jenny (December 5, 2015). "Pet Sounds acknowledged as a masterpiece, as Brian Wilson brings it to Australia". The Sydney Morning Herald. ^ Christensen, Thor (June 25, 2015). "Concert review: Former Beach Boy Brian Wilson shines with 11-member band at the Verizon Theatre". Guide Live. ^ DeRogatis 2003, p. 20. ^ Montes, Kevin (May 16, 2016). "From The Record Crate: The Beach Boys -"Pet Sounds" (1966)". The Young Folks. ^ Ames Carlin, Peter (September 5, 2008). "That Lucky Old Brian Wilson". Oregon Live. ^ Hann, Michael (October 8, 2014). "The BBC's God Only Knows cover – every performance reviewed and rated". The Guardian. ^ Baltin, Steve (September 19, 2012). "Brian Wilson Holds Out Hope for New Beach Boys Music". rollingstone.com. Retrieved February 5, 2017. ^ Loar, Christel (September 4, 2008). "Live From Abbey Road – Episode 12". PopMatters. Retrieved February 5, 2017. ^ Denver Post staff (2 July 2015). "How Brian Wilson heard 'Rubber Soul,' got baked and wrote 'God Only Knows'". The Denver Post. Retrieved 5 February 2017. ^ Gary Ewer, from "The Essential Secrets of Songwriting"
^ Lambert 2007, p. 246. ^ a b c Brennan, Colin; Corcoran, Nina (June 18, 2016). "The Genius of Pet Sounds: Artists Reveal Their Favorite Aspects of The Beach Boys' Classic". Consequence of Sound. ^ a b Lambert 2007, p. 245. ^ Downes 2014, p. 38. ^ Harrison 1997, pp. 39, 42. ^ Lambert 2007, p. 228. ^ a b c King, Dominic (2005). "Sold on Song Top 100 – God Only Knows". BBC. ^ Lambert 2007, pp. 227, 245. ^ Fusilli 2005, p. 102. ^ Viney, Liam (July 12, 2015). "Love & Mercy: what Brian Wilson's story tells us about genius and music". The Conversation. ^ Wilson & Greenman 2016. ^ a b c d e Granata 2003. ^ Fornatale, Pete (November 3, 1976). "Interview with Brian Wilson" (MP3). NY Radio Archive. WNEW-FM 102.7. ^ Fusilli 2005, p. 101. ^ Dillon 2012, p. 114. ^ Howard 2004, p. 65. ^ Gaines 1986, p. 147. ^ a b c Badman 2004, p. 121. ^ Lambert 2007, p. 244. ^ DeRogatis 2003, pp. 20, 35–36. ^ a b Priore 2005. ^ Dillon 2012, p. 113. ^ a b c Doe, Andrew Grayham. "GIGS66". Endless Summer Quarterly. Retrieved October 5, 2014. ^ Elliott, Brad (August 31, 1999). "Pet Sounds Track Notes". beachboysfanclub.com. Retrieved March 3, 2009. ^ Zak 2001, p. 88. ^ "Brian behind the BEACH BOYS". Hit Parader: 11. October 4, 1966. ^ Badman 2004, pp. 121–126. ^ Slowinski, Craig. "Pet Sounds LP". beachboysarchives.com. Endless Summer Quarterly. Retrieved September 24, 2018. ^ Badman 2004, p. 142. ^ Dillon 2012, p. 115. ^ "Pet Sounds Awards". AllMusic. Retrieved 2014-08-21. ^ "Beach Boys singles". Official Charts Company. Retrieved 2014-08-21. ^ Badman 2004, p. 145. ^ Greene 2010, p. 155. ^ Miles 2009, p. 237. ^ Desowitz, Bill (December 28, 2015). "How They Created Those 'Good Vibrations' for 'Love & Mercy'". IndieWire. ^ "The Popdose 100: Our Favorite Singles of the Last 50 Years". ^ "EW counts down the Fifty Greatest Love Songs". Entertainment Weekly. February 2005. ^ Guarisco, D.A. "God Only Knows". AllMusic. Retrieved 2012-02-27. ^ "An Evening with Brian Wilson". International Committee of the Fourth International. October 24, 2007. ^ Kent 2009, p. 3. ^ Broome, Eric (September 2001). "Margo Guryan". Mean Street magazine. Retrieved 26 July 2013. ^ Stanley 2013, p. 220. ^ ""Weird Rock": A Conversation with Simon Neil and Ben and James Johnston of Biffy Clyro". Pop Zap. Archived from the original on 2011-07-15. Retrieved 2011-06-28. ^ Fowler, Matt (May 28, 2017). "The Leftovers: 'The Most Powerful Man in the World (and His Identical Twin Brother)' Review". IGN. Retrieved July 5, 2018. ^ "The Irish Charts – Search Results – God Only Knows". Irish Singles Chart. Retrieved July 11, 2017. ^ Erlewine, Stephen Thomas. "David Bowie – Tonight". AllMusic. Retrieved 28 December 2015. ^ "Rhino Revisits Costello's 'Juliet Letters'". Billboard. 2006-02-03. Retrieved 2016-03-15. ^ Erlewine, Stephen Thomas. "Wilson Phillips: Dedicated". AllMusic. Retrieved July 5, 2018. ^ "A Mighty Wind quartet performs in #1 selling video game in North America". Barbershop Harmony Society. Retrieved March 1, 2018. ^ Grow, Kory. "Hear She & Him Wistfully Sing the Beach Boys' 'God Only Knows'". Rolling Stone. Retrieved 7 June 2017. ^ Fear, David (September 13, 2014). "Heroes and Villains: 'Love & Mercys Paul Dano on Playing Brian Wilson". Rolling Stone. Retrieved September 13, 2014. ^ Grow, Kory. "Watch John Legend Soundtrack Grammy 'In Memoriam' With 'God Only Knows'". ^ a b "God only knows how the BBC made this video". Telegraph.co.uk. 9 October 2014. 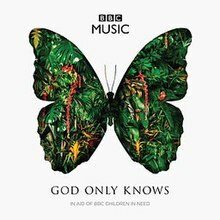 ^ "BBC Music's God Only Knows in aid of BBC Children in Need". BBC. October 7, 2014. ^ "BBC unveil all-star version of God Only Knows, 17 years after Perfect Day". The Guardian. October 7, 2014. ^ "God Only Knows BBC music video: Like a propaganda film made by a dictatorship losing its credibility". The Independent. October 8, 2014. ^ "God Only Knows: not quite a perfect day as BBC sings its own praises". The Guardian. October 7, 2014. ^ "Launches with God Only Knows, a star-studded film featuring 'The Impossible Orchestra'". BBC Music. October 7, 2014. ^ "BBC Music – BBC Music – Who's in the Impossible Orchestra?". BBC. 7 October 2014. ^ "Chart Track: Week 42, 2014". Irish Singles Chart. ^ "Various – God Only Knows Media Forest". Israeli Airplay Chart. Media Forest. Retrieved October 23rd, 2014. ^ "Official Scottish Singles Sales Chart Top 100". Official Charts Company. Retrieved 12 October 2014. ^ "Official Singles Chart Top 100". Official Charts Company. Retrieved 12 October 2014. Dillon, Mark (2012). Fifty Sides of the Beach Boys: The Songs That Tell Their Story. ECW Press. ISBN 978-1-77041-071-8. Downes, Stephen (2014). Aesthetics of Music: Musicological Perspectives. Routledge. ISBN 978-1-136-48691-3. Greene, John Robert (2010). America in the Sixties. Syracuse University Press. ISBN 978-0-8156-5133-8. Harrison, Daniel (1997). "After Sundown: The Beach Boys' Experimental Music" (PDF). In Covach, John; Boone, Graeme M. (eds.). Understanding Rock: Essays in Musical Analysis. Oxford University Press. pp. 33–57. ISBN 9780199880126. Howard, David N. (2004). Sonic Alchemy: Visionary Music Producers and Their Maverick Recordings (1. edition. ed.). Milwaukee, Wisconsin: Hal Leonard. ISBN 9780634055607. Jones, Andrew (1995). Plunderphonics, Pataphysics & Pop Mechanics: An Introduction to Musique. S.A.F. ISBN 978-0-946719-15-0. Miles, Barry (2009). The British Invasion. Sterling Publishing Company, Inc. ISBN 978-1-4027-6976-4. Stanley, Bob (2013). Yeah Yeah Yeah: The Story of Modern Pop. Faber & Faber. ISBN 978-0-571-28198-5. Wilson, Brian; Greenman, Ben (2016). I Am Brian Wilson: A Memoir. Da Capo Press. ISBN 978-0-306-82307-7.